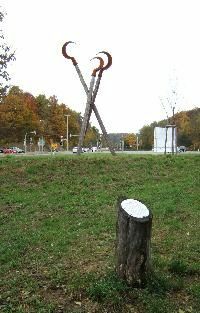 This monument to the Battle of Böblingen (May 12, 1525) can be seen at the intersection of the Stuttgarter and Friedrich-Gerstlacher streets, just down the road from Panzer Barracks in Böblingen. The German Peasant War was fought in the context of the Protestant Reformation in Southwest Germany in in 1524 and 1525. It was one of the first major peasant uprisings in Western European history. I do not know whether this marker is on or near the actual site of the battle. I suspect the site was chosen for other reasons (available space), but I do not yet know for sure. I am getting in touch with local historians and more information on the history of the monument will be available soon. These photos were taken on October 25, 2005. The artist was Lutz Ackermann. You can visit his homepage (in German) at this link. The monument is clearly visible from the road. But drivers have no way of knowing exactly what the three sickles represent. There is a billboard for the local museum on the same field of grass, but the exhibition being advertized is not always about the Peasant War. The thermal baths are on the left. There are a few parking spots on the road across from the thermal baths from which one can access the small path leading past the monument. Only from the path does the visitor see the tree stump with the small plaque explaining what the monument is about. The long, narrow mound, covered with grass, blocks any view of the base of the monument, perhaps intentionally giving the visitor the impression of hidden action - peasants crossing their sickles above their heads or locked in combat. 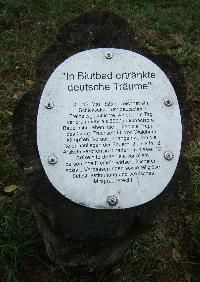 The small plaque reads, "German dreams drowned in blood." / The 12th of May is a fateful day in the German history of freedom. 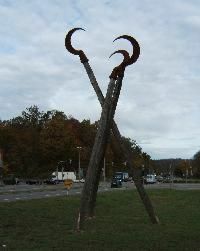 On that day more than 3000 rebellious peasants lost their lives in battle against Georg Truchsess von Waldburg III. The peasants had expressed their desire for reform beforehand and published them in the Twelve Articles. In the Twelve Articles they demand primarily personal freedom, economic and social improvements, as well as religious self-determination and politcal participation. Surprisingly, there is no indication of when the monument was dedicated or who the artist was. Here is a closer view, looking over the grassy mound.